Born into a lineage of priestesses in modern day Glastonbury, England, Sharay is chosen by the Goddess of the Stars and the Sea to help humankind move through the fear and chaos of today's world. To do so, she has to face her grief, loss, and her own dark side. Her way is blocked by her jealous Aunt Phoebe,who uses black magic against Sharay to steal her fortune and her magical powers. 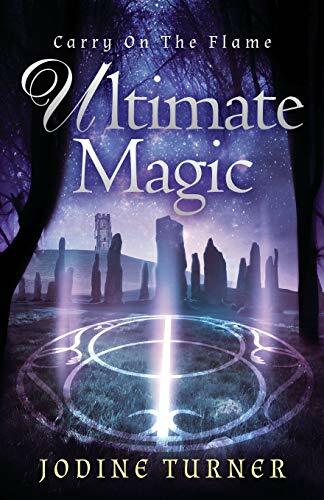 When Phoebe accuses her of insanity and murder, it's the elder, eccentric wizard Dillon who sets Sharay on the Celtic 'Imram,' a quest designed to awaken her magical abilities as a priestess. And it's Dillon's grandson Guethyn who shows Sharay how to open her heart in the Beltaine Ritual, the ancient Celtic ceremony of sacred union. Hunted by the police, stalked by a demonic Tracker conjured by her aunt, and torn from everyone she loves, Sharay struggles with the temptation to fight Phoebe's dark powers with her own. She must transform her fear and hatred for her aunt in order to uncover the mystery held deep within her cells that will allow her to fulfill her destiny - a secret only she can discover. When separated from Guethyn's protection, Sharay continues on her Imram alone, in this spellbinding conclusion to Carry on the Flame.